Groove Knight is Austin's premier Party band, winning The Knot’s Best of Weddings award for 2017! FOR MORE INFO - Click on "Booking Info" above, then click on "Visit Website". Featuring the best of area talent – including the most extraordinary singers – Groove Knight is master of getting the party started and keeping it going all night long. 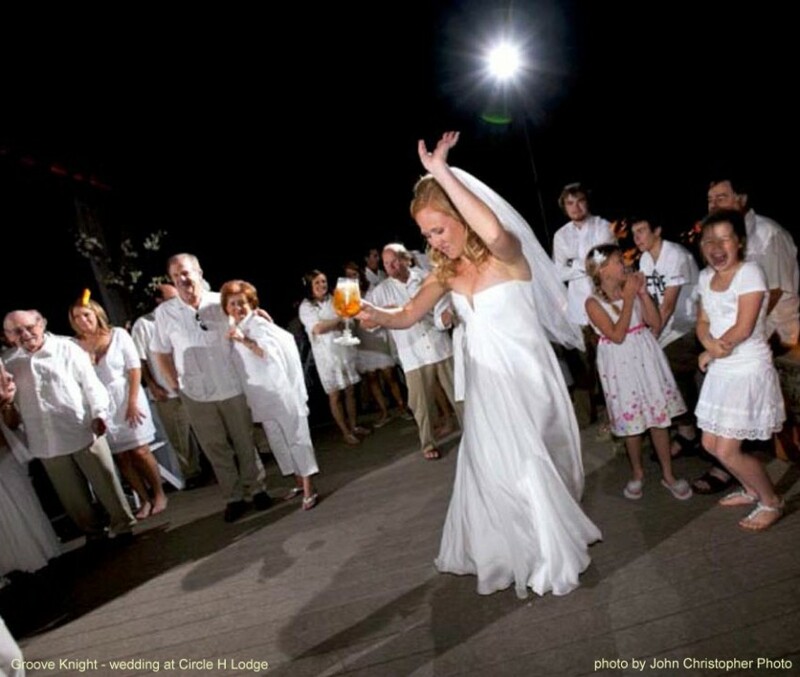 Groove Knight specializes in weddings and events, pleasing all age groups with a high energy performance that sounds like the original artists performing live. It's just the right mix of romantic ballads and electrifying dance favorites, all from a band who knows exactly how to make your big night a party you and your guests will remember forever! My daughter got married in September in Fredericksburg, TX with the reception at the historic Pat's Hall. Groove Knight provided the music and were outstanding. Our guests raved about the band and the range of music and styles that they are able to perform. Dave was very helpful with the song selection precess and was easy to work with throughout the booking process. The band members were very professional, friendly and very accommodating. They kept our guests engaged and everyone had the fabulous time. We couldn't have chosen a better band for my daughter's wedding reception. I recommend them highly and if you are planning a party or reception in or around the Austin area that needs a band... they should be at the top of your list!!! They played for our parents 50th Wedding anniversary celebration. The dance floor was never empty. They were so great to work with and very professional. We loved having them for our event! Groove Knight is Austin's premier Party band. Winner of The Knot’s Best of Weddings award for 2017, and recently named "Top Variety Band in the USA" by the nation's largest online booking company! Groove Knight takes pride in customizing the performance to the needs of the client. They can assist in the planning process and will emcee the events on your special night. At your request they can also perform toned down music for your dinner or cocktail hour before filling the dance floor with the energy of the full band. The musicians of Groove Knight have been entertaining audiences for more than two decades, performing for countless events from banquets and weddings to night clubs, college shows, jazz festivals, live radio and TV, and aboard major cruise lines. 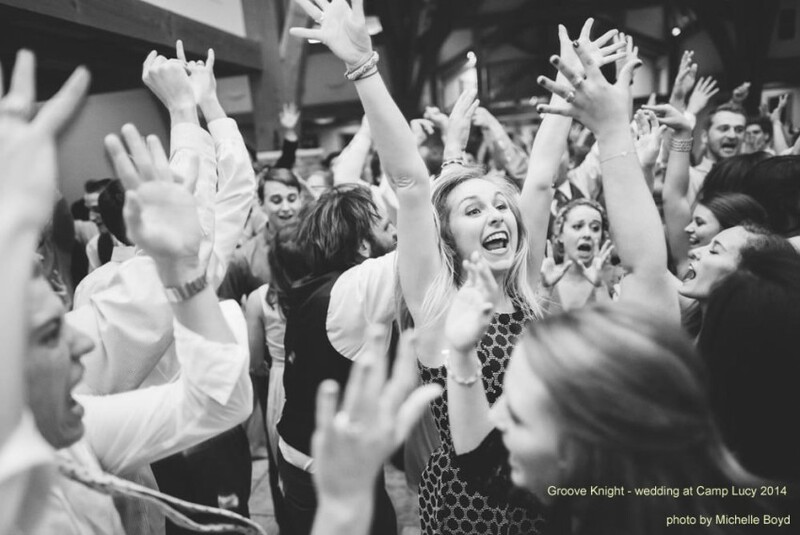 Groove Knight has been the favorite of brides at weddings large and small. Corporate and non-profit organizations from small local school fundraisers all the way to AT&T, Dell, and Southwest Airlines have enjoyed the band. "OH MY GOODNESS!! I don't even know where to begin with how AMAZING you guys were at our wedding!!!!!!!!!! Not only did you guys completely set the tone for our fun filled wedding, but throughout the entire planning process, you were so very professional and listened to every detail that was going on. We felt that you genuinely wanted to do ANYTHING to make all of our dreams of our wedding come true, and our dreams were fulfilled!!" With a range of options from the 5-piece band for intimate events to the incredible 10-piece with a sizzling full horn section and four singers, Groove Knight has options to fit your needs and budget. Always professional, always a party -- All the right music at the right time. I can’t thank you guys enough for the BEST performance I’ve ever seen. We had sooooo many compliments on the music selection during dinner, it was almost from a movie and after dinner was GREAT!!! I had several folks say they wanted to throw a party JUST to hear ya’ll again! You guys made this wedding so special, and to see my sister as happy as she was that night is PRICELESS. Ohh..and you guys knocked it outa the park with the 1st dance and the Father/Daughter Dance, that too was like from a movie. THANK YOU…THANK YOU…THANK YOU!!!! Not only did you guys completely set the tone for our fun filled wedding, but throughout the entire planning process, you were so very professional and listened to every detail that was going on. We felt that you genuinely wanted to do ANYTHING to make all of our dreams of our wedding come true, and because of the fun vibe and music you provided, our dreams were fulfilled!! Each of you were engaged with the guests and played the appropriate music at the right time – which of course ended with high high energy and everyone asking for more!! Thank you guys so very much for everything!!! We were all sooooooooooo sad it when was all over – WE COULD HAVE GROOVED ALL KNIGHT!!! Everyone had such great things to say about 'the band'! You guys really made the party a success - thank you! Dave, the band manager, was so the most responsive wedding vendor I worked with. He immediately responded to every email and phone call for even the smallest question. We couldn't have imagined the night to turn out better, and that is mostly because of Groove Knight. We got so many compliments on the song choices, awesome vocals and instrumentals. They were a hit! You guys were great. Your band is very talented--every song was performed perfectly. Thank you for a professional job. Tell the whole band we thought they were awesome! 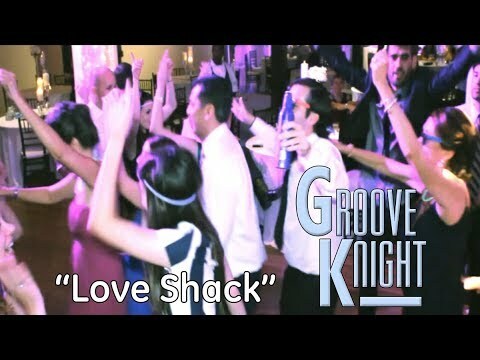 Groove Knight, You were awesome last Saturday night for my daughter’s wedding! Everyone commented on your great performance. It made the reception fun and exciting! The wedding coordinator loved you and appreciated the help that you did not have to provide. She is going to recommend you for other events! Again, Thank you, thank you, thank you! Groove Knight was awesome! Everyone keeps talking about "how great the band was" at our wedding! Wedding planning is very stressful, but Dave from Groove Knight was SO accommodating and easy to work with! If I had a question or needed anything he got back to me immediately. They played all of our favorite songs and kept our guests on the dance floor all night. Thank you Groove Knight for making our reception so fun and memorable! We loved Groove Knight, they were such a fun reception band and had our guests on the dance floor all night long! In addition, they were great to work with and Dave probably emailed with me 50 or more times before the wedding because of all my questions in order to get the details lined up. Additionally, they were able to provide sound and PA services for our outdoor reception! They played all of our first dance songs and announced the evening perfectly and kept the party moving all night long! I would definitely recommend this band for other weddings or parties in the greater Austin area! We had this band perform at our Sepember 24th Gala. This is the second time we have had them booked. I can't say enough good about them. The singers are INCREDIBLE and the band, as a whole, is FANTASTIC!! We have them booked for next years Gala and have decided if we cannot have them play then we will no longer have the Galas. They are professional but a blast to party with. They arrive on time and do exactly what they say they will do and more. If you choose this band I assure you that you will NOT be disappointed. the group leader was responsive & accommodating to our requests. But most importantly, Groove Knight's band members are excellent performers and the synergy they possess is incredible! They really read the crowd well and play such a versatile array of music! And the group is affordable, to boot! All in all, I would absolutely recommend Groove Knight again without hesitation! Groove Knight, A huge thank you for the awesomeness that is you guys! I’ve heard a lot of wedding bands, but I can honestly say that I thoroughly enjoyed not only listening to you guys, but working with you guys! Thank you for being so flexible & I look forward to working with you again. We had an amazing experience booking Groove Knight for our wedding this past September. They were so easy to work with during the scheduling and planning process process, responded to my emails at lightening speed, were a great value (amazing talent and less cost than some other bands I had inquired with), and most importantly were INCREDIBLE at the wedding and kept everyone dancing all night long! Their vocals are spot on and we received countless comments (and still are!) about how wonderful and fun the music was at the wedding. Definitely book this band!! Dave! I can't thank you enough for such a wonderful and fun evening!! Everyone loved the music. I am so happy with everything, it was all perfect. Please pass on our enthusiasm and thanks to the rest of the band. You all are extremely talented and fun!! Very professional in all aspects of the booking and entertainment. Answered all of my questions promptly by email. Very accommodating in song selections and some awesome talent in this group! Would definitely recommend them to anyone for any occassion, especially amenable to dancing! We enjoyed them in every way! Thanks Groove Knight! Groove Knight was AMAZING!! They were everything I hoped for and more! My guests loved the band and so did my husband and I. Not only was the performance spectacular, but the band was so helpful before our big day! No regrets, two thumbs up! Definitely recommending to everyone I talk to about party bands! WOW! What a great time we as well as our guests had listening and dancing to the music from Groove Knight! Everyone really enjoyed the music and entertainment. We had so many compliments on the music. It was exactly what our daughter wanted when she was booking a band. We are honored to pass the word on to others when they are looking for an upbeat and fun band. Can't thank you enough!!! THANK YOU AGAIN! … for being here and playing for us. Folks wanted to know where we “found” you. :-) One couple has another home in downtown Austin, and they were excited because they had heard you before. Everyone loved you guys! Groove Knight INDEED helped make it a wonderful night! Many thanks! Y’all were great! Everyone had a blast. Please tell the whole band thanks for us! I want to extend a personal thank you to all of the Groove Knight members! After searching for just the right band that could play just the right music for my boss' 60th Birthday Party, and after seeing you perform, I knew Groove Knight would be perfect! You didn't let me down! Ginny and all of her guests loved y'all!! The party was a huge success and the music was big part of that! When I am put on the task again next year...I will know just who to call! Thanks for a great party! The band was super! I highly recommend them for any occasion in which you want your guests to have a great time! I booked them for my wedding reception and was glad I did. They accommodated a tricky first dance song, had a terrific variety of songs to play, and were super friendly and professional. I only wish I had booked my venue for longer so that I could have the band play longer! If the occasion presents itself, I'll book them again! In one word... WOW!!! Played the right music at the right moments and never had a dull moment. I'm still getting compliments. Perfect band for any event. Thanks for the Memories! They sounded amazing!! They were easy to work with and our guests loved them. Groove Knight was incredible!!!! My wedding reception was a blast, thanks to them. Not only that, but throughout the entire planning process, Dave was so helpful and accommodating - even with matters that had nothing to do with the music! I cannot begin to express how thankful I am for that. Without Groove Knight, my reception would have been just like any other; instead, they transformed it into the best party of my life! We had a blast- thank you again for being a part of our day! Y’all were amazing! Jesse is still raving about you- how easy and nice you were to work with from the very beginning, during, and afterwards! ( And how talented ) We love y'all and would recommend you to all of our friends. Speaking of, we are hearing from our guests how impressed they were with you as well. Everyone loved all of the different vocals! Thank you for everything! We had such a great time, and the music made people want to get up and dance! We loved everything, and would definitely recommend this band! Groove Knight was fabulous! My Dad said that they were the best part of the evening!! Thank you and the band for being so helpful. We absolutely loved the band! They were the hit of the night. We looked very hard for a band before our wedding and were very impressed by Groove Knight when we went to listen to them. Their performance at our wedding was outstanding -- great energy and musical skills. There are very few bands that can play such a wide range of music so well, and we would recommend them to anyone. Great band! Thanks again for a great night! Best wishes to you and the band! Thanks Dave! The Groove Knight was a perfect compliment to a perfect day. The band sounded great, the musicians were professional, fun and energetic. I received many compliments...what is the name of that band, they sound great, how did you find them, etc. It was obvious my crowd enjoyed themselves immensely. I would not hesitate to hire or recommend the Groove Knight again. Thanks again! I wanted to express my sincere appreciation for the wonderful performance during our fundraiser Saturday, September 18. The band was outstanding. I have received numerous calls today from all my friends about how much they enjoyed themselves. It was indeed a pleasure to work with you. There is absolutely NOTHING I could say negative. It has been a very long time since I have had an evening so enjoyable. Dave, Thank you for everything - you and the rest of the band were so wonderful. We've received rave reviews and credit you for setting the tone for the night that we were looking for. Thanks a million and if you ever need a recommendation, I'd be happy to give one. Wow! From all the comments that we read and the clips that we listened to, we were hoping for something good, but nothing close to what you guys actually produced. You guys came early, set up quietly, got the guests for my 50th Birthday warmed up during dinner, and then completely rocked the house the rest of the night! The music was great and the vocals were simply incredible. You had every person in the house dancing, from 5 years old to 90 years old. Here is how good you guys are: 1) You are so good that I am hesitant to tell anyone else because you will get so booked up I will never get you again 2) ...soon I will have to have a party size of 5,000 or more to book you, and 3) I am now actively planning my next party with you as the main feature, and then figuring out the other little stuff like a reason, theme, location, etc. I could not be any happier with having you guys at my party... Thanks for making my 50th birthday party the party that everyone will remember for a long time to come. Groove Knight did an awesome job at my reception. The right tunes at the right volume with the right energy. They kept the dance floor full all night long with everyone from grandparents to grade-school cousins joining in the fun. They were very professional and extremely talented - I got lots of comments from my guests about the great band. We were a bit late getting started for the evening and they even skipped one of their breaks to maximize the time we had left. I'm glad we decided to go with a live band and hire these guys! Your group was great in every way! We had a blast. Great band! They were very professional and courteous. They took the initiative to stay in contact concerning the details of the event. They were on time and dressed professional. Very talented group that made my wedding reception very memorable. I highly recommend this band. Ya'll were great. Everyone loved you. Will use you again. You guys were a pleasure- Thanks so much! Everyone enjoyed the event. I received so many compliments about your band. You guys were a huge hit with us as well as our guests! They were fabulous! When they first started playing, we thought it was a record. They had so much energy throughout the entire night and kept a crowd on the dance floor. Everyone kept asking us where we found these guys. I would recommend them to anyone without a single hesitation. They definitely made our party a hit!